Following last summer’s quite successful – in terms of participation and participants’ enthusiastic response – the 2nd Pulsar Festival is preparing for yet another summer of events in 2015. Three days of music, rarely available and highly demanded by a well-equipped artistic public, this year’s programme includes three ensembles which will present their work on the beautiful, historic island of Samothrace. 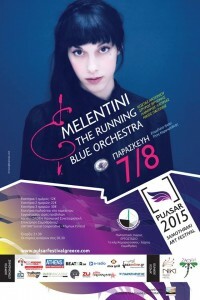 Premiering its events on August 7, 2015, the Pulsar Festival presents Melentini and the Running Blue Orchestra on the first night. Melentini will present works from the entire spectrum of her repertoire, including her album, Explosions Around the Desert Inside, released in 2013. A jazz, avant – garde, minimal, dark style work, which was received with dithyrambic reviews by the public. On the 8th of August, Michalis Siganidis and his ensemble, «Siganidae 5» will perform his work “97%”, a work which has been received with great enthusiasm by the public each time it was performed on stages in Athens and elsewhere in the country. Finally, on the last night of the festival, 9 August, Giorgos Christianakis and his multi-member ensemble will present a unique interpretation of Artur Rimbaud’s A Season in Hell. This performance includes a video-wall installation performance which complements the musical and narrative parts of this fine work. Given that last year’s 1st Pulsar Festival received the enthusiastic “applause” of a public — which for all the three nights of the festival filled the most attractive stage and the old factory renovated for its events – that uses a special set of criteria for its entertainment, we are certain that this year’s 2nd Pulsar Festival will open its doors to an even more excited crowd. Those who visited us last year declare that they will be coming back for more. And this time they will certainly bring their friends.